Middlesex alumnus and Grammy® recording artist, Matt Annecharico, has partnered his company, Dreamscope Media Group, with a team of current students to host a live online charity broadcast on Thursday 10 May 2018. As Executive Producer, Matt will be joined by Dale Wightman (Director) to film from 15.30-16.30 using the University's state-of-the-art television production studio. The show will feature interviews and stories by people who have Muscular Dystrophy, as well as words of support from special guests. Viewers will be able to watch live online through YouTube, Facebook and other social media platforms. 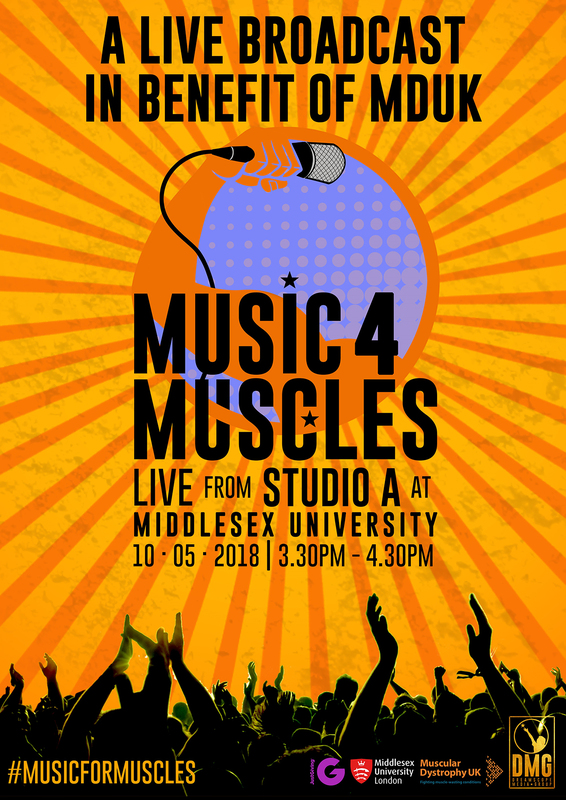 ‘Music 4 Muscles’ has been organized as part of Middlesex University’s work experience programme, MDXcel, which links students to industry through enabling them to work on real-life projects. Following an initial proposal from Dreamscope, students on the Music Business and Arts Management course pitched their fundraising ideas to the team at Muscular Dystrophy UK. Once the project plan was agreed, the team utilised the company's collective knowledge and experience to gain valuable insight and support in moving forward with the event. Matt graduated from the BA Popular Music degree in 2016 and started his business through support from the University. He is especially excited to collaborate with Middlesex for a cause close to his heart. Dr Simon Best, a specialist in Innovation and Entrepreneurship at Middlesex University’s Business School, supported Matt during his studies at Middlesex and after graduation. “Middlesex University is all about working with students who have the potential and the desire to make a positive impact in whatever they choose to do, through giving them the environment and opportunities to help them transform their lives," he said. As well as support for the Music 4 Muscles fundraiser, Dreamscope has employed two Middlesex students who will run the Music Publishing arm of its operation, and one student as a Corporate Relations Manager who will form part of the British delegation at the June MIDEM conference in Cannes. You can also follow the team on social media for live updates - check out their official Facebook and Twitter channels for further information. Donations to Muscular Dystrophy UK can be made through JustGiving or by texting 70070 and typing MDUK86 together with the donation amount in the message. Throughout the show, donors will be eligible for raffle prizes including tickets to Disney’s “Aladdin” in the West End and music gear from StudioSpares, among others. Other sponsors include Tesco, Nuffield Health, Orange Amplification and Sofa.com.